Landscaped Illusions curated by Mariavelia Savino, Curator of Contemporary Art Projects USA will be on display from December 4-9th, 2018 at Scope-Miami International Contemporary Art Fair, Booth G13 as part of Art Basel Miami Week. Kelly Fischer will be part of this exhibition which encompasses a diversity of artistic media and densities. From paint/collage on steel and cement canvas to urban street landscapes or three-dimensional views of skies, waters or topographical lands, from sculptures in polished steel or cement to dreamlike Plexiglas or glass mounted photographic images fulfilled by mystery and fantasy. Our goal is to present the expansion of the human mind through Art, as an unlimited source of imagery, depictions, thoughts and feelings, endless and infinite, as it is the Universe in which we live, either the real one, or the one fulfilled by the magical abstract visions that Artists create while depicting it. A section of the exhibition will relate its visitors with visions of graffiti and branding, including a subtle night view of Manhattan, New York, and a motivating tribute to Basquiat as one of the masters that mastered this genre so popular in NYC. The other section is about landscape and nature. The unique artistic pieces will travel from the deep sea to the infinite space, as well as by the wonder of the minimal transcending as major Art theme, and also by depictions of a fantastic world, where animal and human are able to merge, beyond pain or destruction. Tribute to Jean Michel. 72″ x 72″ Paint on Concrete with Steel Bars. Indoor/Outdoor Artwork. Ricardo Cardenas-Eddy, a successful artist born in México, is growing his career as his exhibitions and rising popularity demonstrate. 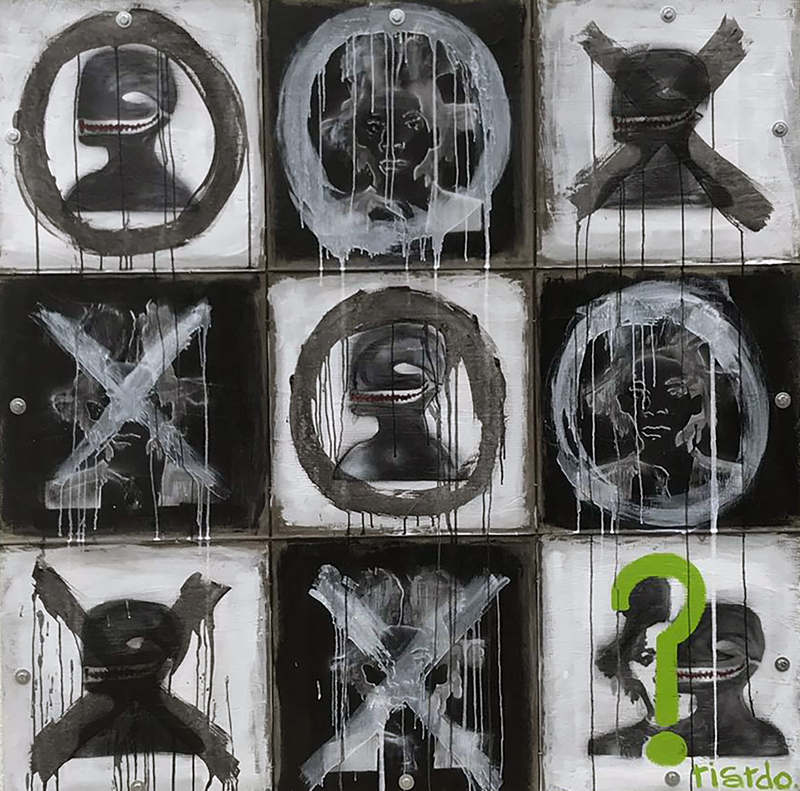 Cardenas expresses his feelings and beliefs by connecting his Art, in media and technique, with his career as a construction engineer, creating his paintings cleverly using building materials, concrete and steel bars, as his artistic media. This year at Art Basel Miami week, the New Own Free Style by Ricardo Cardenas will reach a peak level at Scope Art Fair with his Series of Tributes to Great Masters and with his Series of The Muses of Ricardo, as the Artist has opened a new path for the Visual Arts that transcends time and space conceiving a new way of celebrating Art History and a novel manner of innovating the media and techniques to depict it. A genuine and original creator, always presenting fresh unique proposals, he proves this with his exquisite Series of Tributes to Great Masters reinterpreting the main traits of the ART from one or more chosen master artists. On his canvas of cement and iron bars, he paints and adds collages for the whole to look like a unique poster or street graffiti on a cement wall. These astonishing Artworks are greatly admired by viewers and art collectors. Cardenas brings his interpretations to our present time when he uses the unforgettable imagery of an international master but also makes it his own. The fusion between the diverse artistic visions is perfect. In addition, when he uses the motive of the Tic Tac Toe game he wants to tell that Master Art is for all people, as popular and accessible as can be a worldwide played game. For the Contemporary Art Projects Booth at Scope Art Fair, we selected the unique cleverly conceived Tribute to Jean Michel, in which an image of Jean Michel Basquiat, b. 1960 – d. 1988, plays a Tic Tac Toe game against a painted face that was a characteristic theme by the celebrated Artist. Presented by Contemporary Art Projects USA, his impressive Artwork El Juego de las Fridas sold during the Opening Night of RED DOT Art Fair 2017. In this Artwork, Cardenas merged the ART of two Great Masters: Frida Kahlo, b. 1907 – d. 1954, Mexico, and Andy Warhol, b. 1928 – d. 1987, USA, using a Tic Tac Toe game as background that allowed him to depict nine images of Frida displayed in the characteristic multicolored Warhol manner. From November 2018, El Juego de las Mona Lisas, a double tribute to Andy Warhol and Italian Renaissance Master, Leonardo Da Vinci, b. 1452 – d. 1519, will be on show at the Delano Hotel. During Art Basel Miami week Ricardo Cardenas will show his sculptures at SLS Brickell. 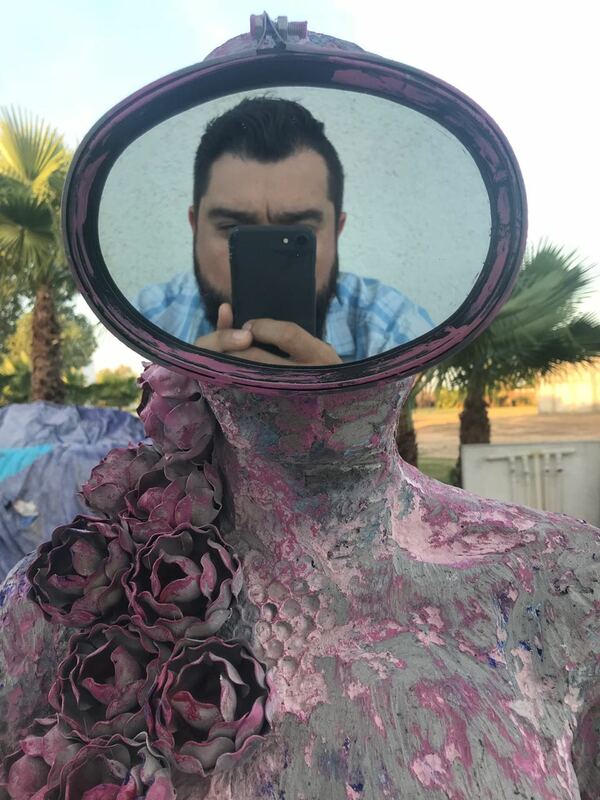 At Scope Art Fair Ricardo Cardenas will also show one of his Muses with a mirror glass scuba mask, in which viewers will be able to see themselves reflected and feel as a Muse of Ricardo. The Mis Musas (My Muses) Series by Ricardo Cardenas-Eddy are inspired by the seven Art Muses created by Zeus in Greek and Roman Mythology that guided Classical culture and the thinking of humanity for centuries. The Muses of Ricardo encompass seventeen exquisite one of a kind sculptures, each different from the other, representing a Cultural or Human concept defined by the Artist. Made in his characteristic cement and steel bars media used by Cardenas for paintings or sculptures, the Artworks will appear as if they were digging out from a cement block or wall. Each base, on which they stand, has a color to represent the wall from where the piece came. The sculptures depicted in human scale to obtain a closer approach to reality, will not have a race, gender or age, as the idea is to eliminate stigma. They are distinctive in color and technique, as for the finishing touches varied materials were applied, such as wood, metal, resin, paper or paint. Themes and names are diverse, like the language for the title of each. The Artist’s goal is to transmit a Universal Message. byMariavelia Savino, Curator, Contemporary Art Projects USA. Celebrating its 18th edition, SCOPE Miami Beach returns to its bespoke pavilion on the sands of Ocean Drive and 8th Street. Honoring its ongoing mission to provide a platform for discovery, it will welcome a diverse range of contemporary exhibitors, including a selection of participants representing SCOPE’s New Contemporary section. This year will continue with their acclaimed 360° experience of VIP Programming, immersive Special Projects, compelling brand integrations and a dynamic array of Museum and Cultural Partners, as well as welcoming legendary publication HI-FRUCTOSE to the SCOPE Atrium, midst praise from collectors.